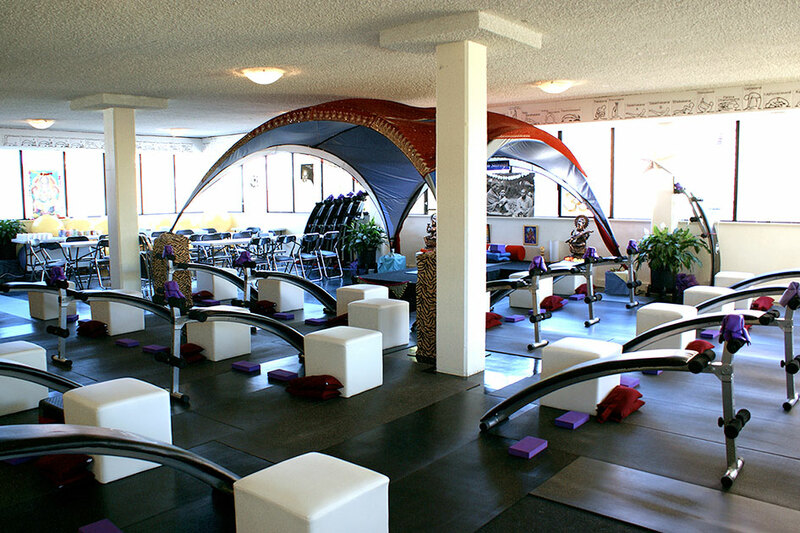 Yoga Workshops at Yogareal are concise times to work very specifically with themes and techniques to enable optimum results for each individual. 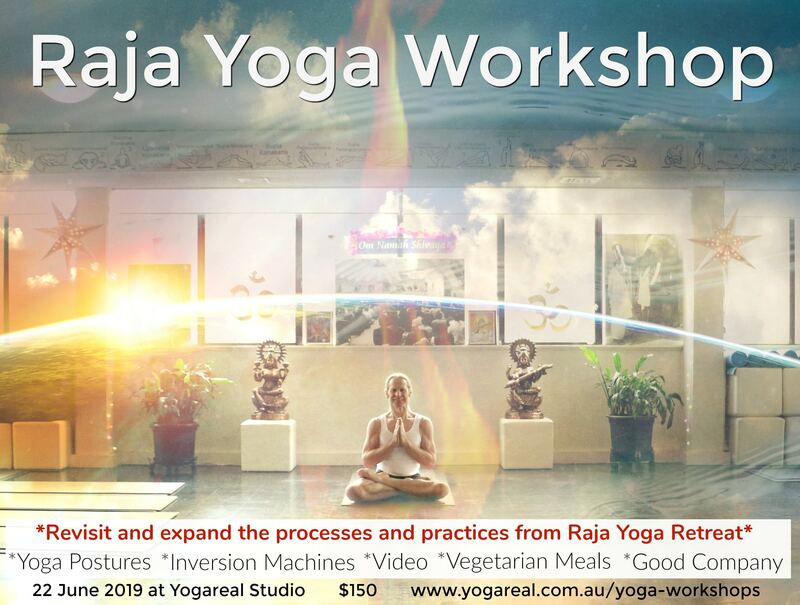 Revisit and expand on processes and practices from the Raja Yoga Retreat. Saturday 22 June 2019, 7am to 8:30pm. Saturday Spa at Yogareal is a chance to restore, rejuvenate, realign and rejoice! 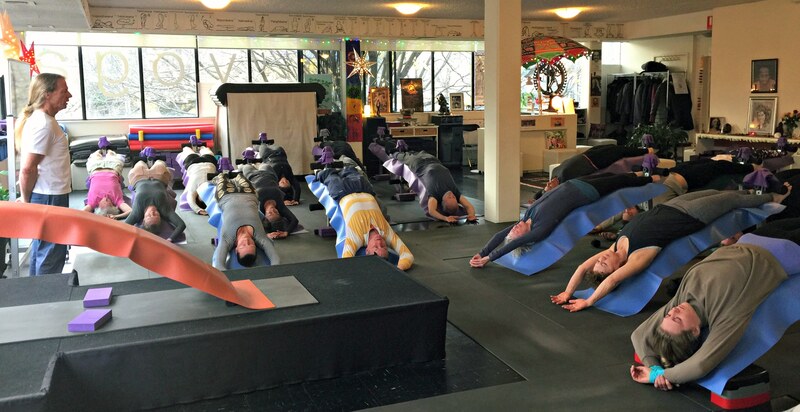 Join us for a one-hour restorative yoga session with other Yogareal students. You’ll all have your own personal bench for the duration of the session. Your pelvis and spine will be re-aligned (all problems with back, neck and shoulders are due to the pelvis collapsing and a lack of stability in the core/deep abdominals and hence the spine collapses, vertebrae jam and nerves pinch). Your breath will be light, soft, strong and long. You’ll straight away feel connected to yourself, peaceful, light-hearted and grounded. The session draws to an end with a chai and a social chat. Restore, rejuvenate, realign & rejoice! This whole environment / lifestyle led to balance, upliftment, being in our body, grounded, in touch with life, strong, vital, practical and skilful. This whole lifestyle needed nothing else. It was complete – healthy, happy, simple. However, during youth and as a person leaves youth and goes into adulthood, what is essential and required is that the consciousness and the intelligence of each person and how they work in themselves and how their energies work with life, needs to be known. Most people never acquire this knowledge, and hence they lose their child-likeness, light-heartedness and strong flow of vital energies… they tend to become an “old person” or an “adult”. Most people, in order to maintain their child-likeness or exuberance seek other external means to try and reclaim it – alcohol, food, drugs, extreme behaviours, neediness – however all of this just makes everything worse – complicated, more intense, heavy. This then carries through in all their relationships – family, work, loved ones. Their energy doesn’t flow, and their heart’s have closed and therefore they’re not open-hearted people. The whole consciousness transition is the second part of classical yoga, and really the most important step in yoga. This step of people understanding themselves is not there in most frameworks or systems around today. It’s either the energy side of things – postures/exercise/sport, or the consciousness side – meditation/psychology/philosophy. There’s a lot of theory, there’s a lot of writing, there’s a lot of teachings, but where are the practical realistic ways of integrating this understanding into day to day life, without being a space cowboy???? Or in other words being disconnected, unable to cope or integrate life, despite knowing all the theories and having the best of intentions. The releasing of the breath, working with the breath, guiding and directing the breath, is the essence of the vitality (postures) transitioning into the consciousness for a person, while still retaining light-heartedness, and this has to be taught and then understood in oneself. The latter part of my life has been spent acquiring this understanding and being able to convey this to other people in a natural, down to earth, grounded way. This then makes yoga a complete system for each person. Their ability to flow with life is then innate. – THEY’VE MOVED THE RIVER AND PUT THE EASTERN FREEWAY THERE!! 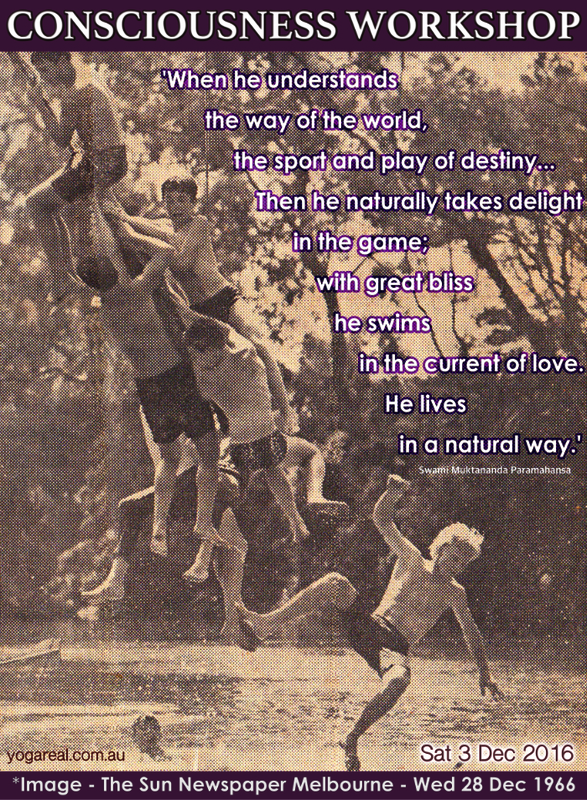 …So we’ve got it all happening at Yogareal at the Consciousness Workshop on 3 December 2016 – FIFTY YEARS ON!! – We’re no longer on the rope, we’re using benches for the alignment – hanging and using gravity to gain length in the body. – We’re using practical light-hearted techniques to release the patterns of restriction. – Summarising and encapsulating the essence of 50 years of transformation. – A summary to this year and the last 50 years! First time at Yogareal and probably first time anywhere, we’re running a headstand workshop from now through to the end of next week. This will feature step by step openings, alignment and lengthening of the body, and then performing the posture. There’s a lot of people everywhere doing yoga, but very few do headstand and do it well. By that I mean, do it with lift, lightness, alignment, and length of breath. All these factors have to be there for the posture to take place, and therefore the advantages of the posture to take place. If any of these factors are not there, then it means that the posture – headstand – is collapsing. The posture needs to be lifting for the energy to flow through from the base chakra to the crown of the head, which is the length of the spinal column. The headstand is considered the King of all postures – the most important out of the, in theory, 54,000 postures. 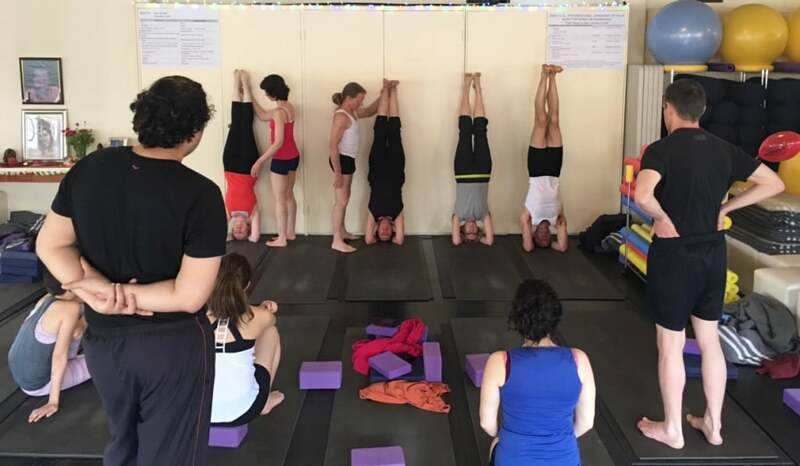 In this workshop, all of these factors I mentioned will be addressed systematically, and therefore the headstand as such will happen automatically. – Floor work on the mat to open the pelvis, shoulder girdle and spine. This has to happen, otherwise the back muscles are not released and therefore, the breath can’t be long in the front of the body, and therefore, uddiyana bhanda is not available and therefore the lift is not available in the shoulder girdle and back down into the legs. – Work on the wall at right angles. To work all these areas strongly and therefore to lift and overcome gravity’s collapsing effect in one’s body. 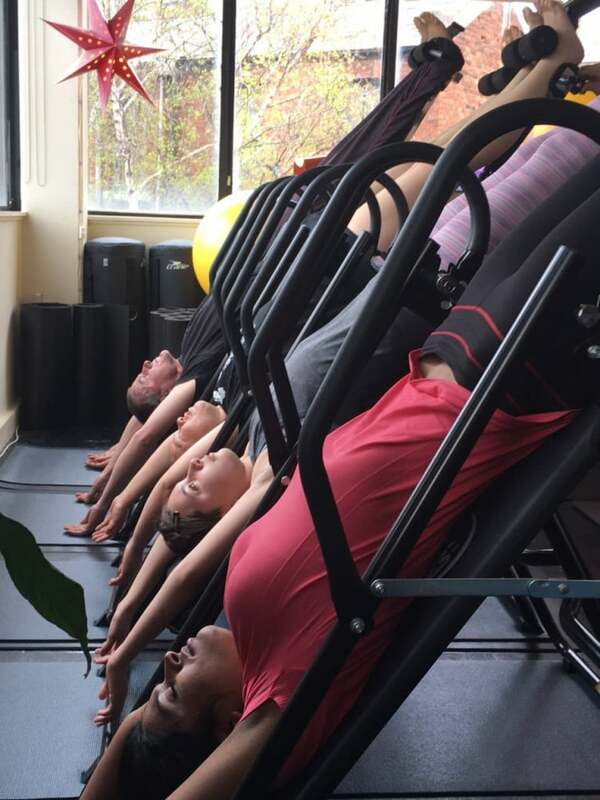 – Work on the inversion benches to totally release the whole body, and allow it to lengthen and align the body through the side plane. All this by means of gravity, you just have to let go. – Back to the wall – inhale exhale, you’re guided through the headstand posture using the wall as a guide and having myself to spot you and therefore work the areas that are lazy in your body e.g. tailbone under and bottom ribs back, so therefore udiyanna bhanda is there for you and your body is lifting and aligned. Once again, this will all happen by itself, all you have to do is make yourself available and come along. THE WHOLE PROCESS IS SELF ADJUSTING, SELF ALIGNING. -pituitary and pineal glands in the brain are balanced and stimulated – our growth health and vitality depend on the proper functioning of these two glands. If your a sincere practitioner of yoga, you should be able to practice headstand easily. Seize the opportunity – come along, master it! !